I have a thing for cake donuts. 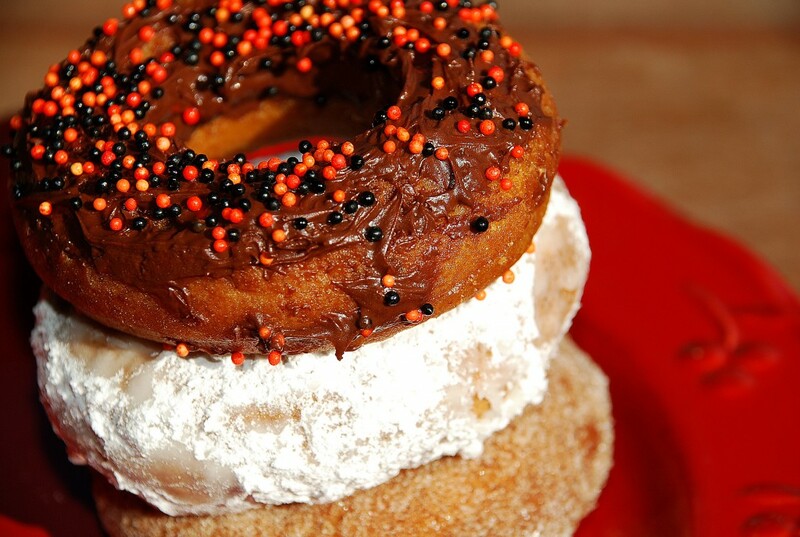 Or is it cake doughnuts? Or cake donies as my kids say? No matter. There’s something about fried dough that’s been kissed with cinnamon sugar that makes me want to put on my flannel PJs and watch reruns of Who’s the Boss (while eating platefuls of donuts, of course) all day long. For a long while, I was misinformed about cake donuts. I believed they were not deep-fried…and I wish I could return to that state of bliss. But alas, just like their yeast-leavened counterparts, they take a bath in hot, bubbly oil. Because of this, I resisted learning to make them at home — deep-frying always seemed so greasy and gross — but when done at the right temperature these donuts are the antithesis of greasy…warm and sweet with just a hint of spice. In a bowl combine 3 1/2 cups flour, 1 tablespoon baking powder, 1 teaspoon cinnamon, 3/4 teaspoon salt and 1/2 teaspoon ground nutmeg. In another bowl combine 1/3 cup milk and 1/2 cup butter (melted). In a large mixing bowl combine 4 eggs (beaten) and 2/3 cup sugar; beat with electric mixer until thick (about 5 minutes). Add butter mixture; stir with a wooden spoon to combine. Add flour mixture and stir with a wooden spoon until smooth. Cover dough; chill at least 2 hours (dough will remain slightly sticky). When you’re ready to go, add about 8 cups of vegetable oil to a large dutch oven. Plop a deep-fry thermometer in and let the oil get cookin’. You’re aiming for 375 degrees. Turn dough out onto a lightly floured surface. Roll dough to 1/2-inch thickness. Cut dough with a floured 2-1/2-inch round cutter. Use a 1-1/4-inch cutter to cut the hole for the donut. Once your oil is 375 degrees, use a large slotted spoon to slide one donut into the oil. After about a minute it will be all bubbly like this, an the underside will look golden. Then you can use your trusty spoon to go in and flip it. Cook for another minute or so, then remove and place on a paper-towel lined plate. Once you get the hang of it, fry 2 or 3 donuts at a time. Remember to keep tabs on the temperature…adding more donuts will lower it so you may need to jack up the heat to keep the oil at 375. And don’t forget the donut holes…those are my favorites! Throw 5 or 6 in at a time. Flip after about 40 seconds. So unbelievably warm and good. But the little guys are my favorites. Melted chocolate, powdered sugar, cinnamon sugar, sprinkles etc. Once your oil is 375 degrees, use a large slotted spoon to slide one donut into the oil. After about a minute it will be all bubbly and the underside will look golden. Then you can use your trusty spoon to go in and flip it. Let donuts cool and decorate!